E-Guns - Hositrad Holland B.V.
Thermionics' e-Gun™, an electron beam evaporation source, is used to produce uniform high-purity films and optical coatings. The compact design and ease of maintenance make it useful in practically all vacuum systems and for many varied applications. It has been used to evaporate refractory and dielectric materials, as well as the more common conductive and semiconductor materials. 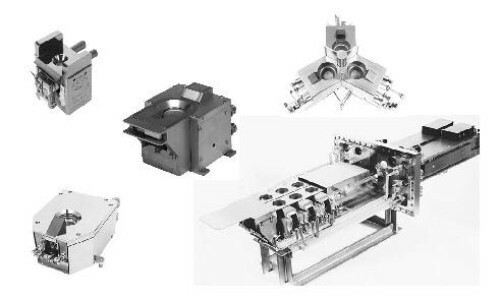 e-Gun™ evaporation sources are reliable and simple to operate. They are equally suited for research or production applications. Electron beam heating is an efficient way of achieving temperatures in excess of 3500°C (6300°F) for uniform thin film, optical coating and vacuum metallurgic processes. The all-metal-sealed models are bakeable to 230°C (446°F). The e-Gun™ source and companion control power supply have been designed to be part of any high or ultra-high vacuum system. 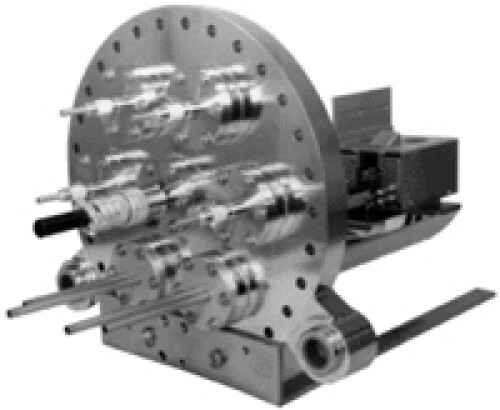 The e-Gun™ source is a self-accelerated electron beam device. A beam of electrons, held at a high negative potential, is produced by the hot tungsten filament. The beam of electrons leaving the filament is magnetically focused and then deflected 270° by the integral permanent magnet. The electron beam is accelerated into the evaporant material contained within the water-cooled, grounded crucible. The beam strikes the evaporant material with a spot of approximately 1/8” diameter and an intensity of approximately 25 kW/cm2. 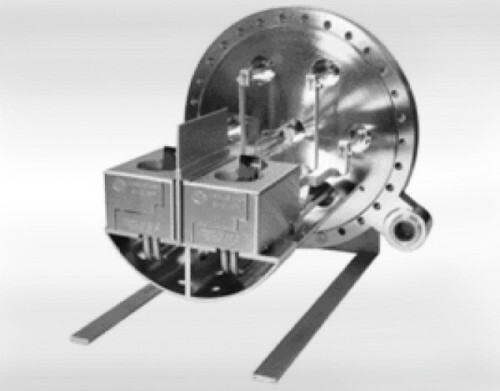 Sweeping the electron beam across the evaporant material contained in the crucible is performed by an electro-magnetic system, with either manual or automatic controls. The rate at which source materials may be evaporated is dependent upon power input, charge size, charge shape, and the characteristics of the material to be evaporated. The highest evaporation rates are obtained with materials that have low evaporation temperatures and low thermal conductivity. The evaporant vapor cannot become contaminated because the focused electron beam strikes only the evaporant source material in the crucible. The beam deflection and effective shielding keeps the filament hidden from the evaporant vapor. The crucible is cooled so efficiently that its surface never gets warm enough to react with the evaporant material. The e-Gun™ source will operate in a system base pressure as low as 5 x 10-11 mbar. The magnitude of pressure, which normally increases during evaporation, depends on the pumping capacity of the system and the cleanliness of the evaporant material. This pressure increase is minimized by the high thermal efficiency of the source. There is minimal outgassing of surrounding surfaces because only the evaporant is heated. All of the single, linear motion, three and five position e-Guns are 100% metal-sealed, thus eliminating “O” ring outgassing. Outgassing could require additional pumping capacity and sometimes result in sample contamination. Please specify the mounting configuration at the time the order is placed, the prices listed may not include the bolt-type or flange-type mount. Other mounting flanges, configurations and geometries are routinely supplied, please call the factory for further information. Any e-Gun™ can be designed and manufactured to fit existing or new systems. Please consult the factory with your special requirements. e-Gun™ is a trademark of Thermionics Laboratory, Inc.